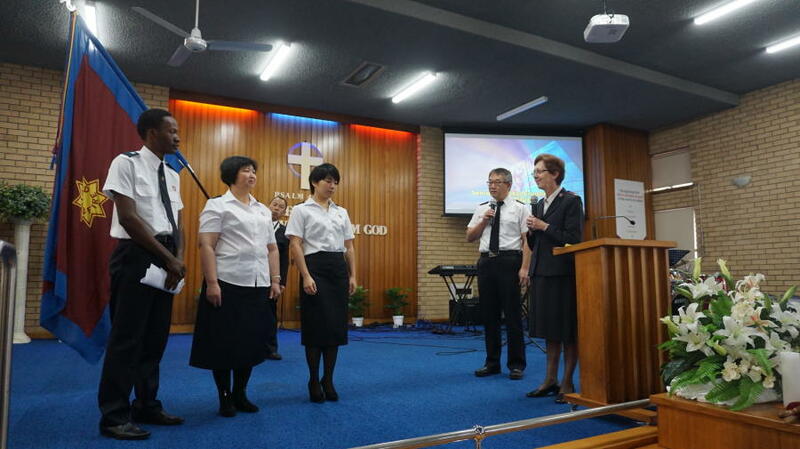 The Bankstown Corps LETS Choir with Lieutenants Frank Wang and Belinda Zhou. Meijuan Yang wanted to learn English and likes to sing, so when she heard about Bankstown Salvation Army’s LETS Choir, she was delighted. LETS stands for “Learn English Through Singing”, but it is the opportunity to explore faith and build relationships that keeps many choir members coming along. Bankstown Corps Officer, Lieutenant Frank Wang, says the choir began in 2016 out a desire of a number of corps folk who wanted to help others. One of them was a piano player and suggested a choir. After advertising on social media, the choir began a few months before Christmas, with Silent Night the first song learned. A professional vocal teacher who soldiers at Springwood Corps in the Blue Mountains, Yang Greenaway travels to Bankstown every week to teach the choir. Other volunteers, Hermen Kung and Raymond Tang, teach English using the Simple English Bible as the text book. The pianist is Winnie Kung while Mary Jin and Susan Gong also assist on a voluntary basis. While everyone in the choir is on their own spiritual journey, from those who have faith to those who are still exploring what it means to follow Jesus, they all take part in Scripture reading and prayer during the weekly LETS Choir practice. “They don’t think they are a church but when we look at the group, it’s got all the elements we do in church. They sing worship songs, there’s a sharing of the Scripture and a message. There’s also prayer,” says Lieut Wang. Earlier this year, leaders invited choir members to Bankstown Corps’ Mother’s Day service and of those who came, one of the women gave her life to Christ. Another choir member, Maijuan Yang, has just become a soldier of Bankstown Salvation Army (Maijuan is pictured second from the left during her enrolment). Bankstown LETS Choir performs a number of times during the year at Aged Care Centres, including The Salvation Army’s Weeroona Village Aged Care Plus Centre. Earlier this year, the choir was asked to perform at The Salvation Army’s Red Shield Appeal Multicultural Launch where they sang You Raised Me Up. As well as Silent Night and You Raised Me Up, the choir has also learned 10,000 Reasons and Amazing Grace.